1. What are the issues faced while planning and executing quadricepsplasty in cases of femoral fracture treated with external fixator? 2.How to predict and prevent refractures in these cases? Case Series: Volume 3 | Issue 1 | JOCR Jan – March 2013 | Page 3-6 | Noda M, Saegusa Y, Takahashi M, Kashiwagi N, Seto Y. Introduction: In performing quadricepsplasty for contracture that develops after application of an external fixator for femoral fractures, surgeons must be aware of the potential risk for re-fracture and pin-related problems. The purpose of this report is to highlight these not well-detailed complications and to discuss specific findings and treatment suggestions. Case Report: 4 men (mean age, 40 years) presenting with secondary to contracture that developed after application of an external fixator for femoral fractures were included in this study. The radiographs showed union across the fracture site however two of these patients couldn’t stand on one leg raising suspicion about the union status. A computed tomographic image indeed demonstrated limited continuity of the cortex. Bone grafting was performed prior to quadricepsplasty. The mean extension and flexion before the quadricepsplasty were 0o and 570 , respectively. At the final follow-up examination, the mean active flexion of the knee had increased to 98o. Results: The incidence of re-fracture during and after quadricepsplasty has been reported to be between 10 and 25%. There are 2 preoperative features that may mislead surgeons into believing that complete union of the fractures has been attained: one is the patient’s ability to stand on a single leg, and the other is the fact that plain radiographs may lend themselves to different interpretations. 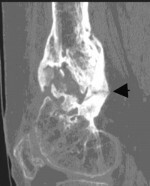 In such cases, computed tomography will provide evidence of the continuity of the cortical bone. Bone grafting in 2 of our patients is thought to have prevented the postoperative complications of re-fracture. Complications at pin sites induce contracture at surrounding structures. When extreme tightness of the skin is noted, a tension-releasing procedure such as a skin graft should be performed. Keywords: Quadricepsplasty, femoral external fixator. Extension contracture of the knee is commonly observed after severe fractures of the femur, particularly those that occur in the supracondylar area [1,2]. When the contracture is severe enough to affect activities of daily living, quadricepsplasty can improve knee flexion. This procedure, however, is accompanied by complications such as extension lag, infection, and skin necrosis in as many as 67% of cases [1,3]. Surgeons should be aware of the likelihood of these complications and should take steps to reduce their incidence. The purpose of this report is to highlight the importance of these 2 complications that develop after the application of external fixators, and to discuss strategies for minimizing them. Between September 2004 and May 2010, modified quadricepsplasty for contracture that developed after application of external fixator for femoral fractures was performed in 4 men with a mean age of 40 years (range, 23–67 years). The causes of knee contracture included distal femoral fracture in 3 patients and both femoral and tibial fractures in 1 patient. Three patients had sustained open fractures. In these three cases, external fixator had been applied external fixation for 11 months in average. During the application of an external fixator and after its removal, the patients underwent physiotherapy, and a few weeks before the removal of external fixator, the frame was dynamized. The indication for quadricepsplasty was extension contracture of the knee that did not improve despite the consecutive physiotherapy for at least 6 months after the removal of the Ilizarov frame. The mean interval between the removal of the frame and the quadricepsplasty was 8 months (range, 6–12 months). Preoperative assessment for quadricepsplasty:The knee and distal thigh were closely examined for edema, ecchymosis, induration, tenderness, and tightness, which indicate an increased risk for postoperative skin ulceration and necrosis. The patients showing signs of infection were excluded from the quadricepsplasty. The mean knee extension and flexion of the patients in our study group before the quadricepsplasty were 0 and 57 degrees, respectively. The single-limb standing test relates the degree of osseous continuity as well as the ability to maintain standing balance. Two patients out of the 4 patients maintained a single-limb stance with the knee in a locked position but had difficulty with the knee in a slightly flexed position. Radiographic evaluation: The radiographic examinations revealed the extent of the fracture union or osteoarthritic change at the tibiofemoral joint. The radiographs of the supracondylar fractures of two patients in the group suggested incorrectly that osseous union had been achieved (Fig. 1); however, the computed tomographic images demonstrated limited continuity of the cortex (Fig. 2). All the patients had minimal osteoarthrosis. Bone grafting at the fracture site: Two patients with proven incomplete fracture healing underwent autologous iliac bone grafting at the fracture site before the quadricepsplasty (Fig. 3) and required at least 4 months of recovery before they could easily stand unaided on the injured limb. Operative technique: The surgical procedure is outlined as follows and consisted of 3 phases, which have been described by Thompson  and, more recently, by Ebbrahimzadeh et al. At the end of each phase, manipulating force was applied. 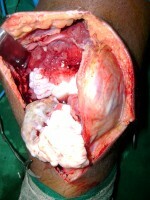 The dissection was stopped at the phase of the procedure when the knee can be flexed satisfactorily. 1. Adhesions in the suprapatellar gutter and between the patella and the femoral condyles were released, and the medial and lateral retinacula were severed through a longitudinal lateral oblique incision. Adhesion around pin sites was frequently observed in the lateral structures of the extensor mechanism. These structures include the iliotibial band, the vastus lateralis, and the lateral retinaculum. These findings are related to the surgical method, in which many half pins pierce the lateral structures. 2. The rectus femoris, vastus medialis, and vastus lateralis are separated from the vastus intermedius. 3. The proximal portion of the vastus intermedius tendon is snipped and sutured to the distal portion of the rectus femoris tendon, with the knee in the flexed position. If overtightened skin is noted, a tension-releasing procedure such as a skin graft should be performed in addition to the quadricepsplasty. In these cases and those of persistent secretion from the skin incision, rigorous rehabilitation should be delayed until the tension or secretion subsides. None of the patients in the study group had skin sequelae at the pin sites. One patient showed continuous serous secretion along the skin incision that healed uneventfully after several weeks. The length of follow-up period after quadricepsplasty ranged from 6 months to 3 years. At the final follow-up, the mean active flexion of the knee was 98o (range, 40–135o), which indicates an the overall mean flexion gain of 41o. None of the patients had a flexion contracture on active and passive extension throughout the preoperative period or on the follow-up examination. None of the patients experienced refracture during the follow-up period. Minimal extension lag remained in 2 patients. It is important that, surgeons are constantly aware that patients treated with external fixation have generally sustained serious injuries to the bone and soft tissue and thus, they experience greater difficulty in bone healing than do patients treated with plates or intramedullary nails. They also tend to develop skin tightness due to severe injury, long periods of pin application, and repeated surgical intervention. 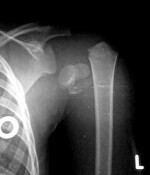 When refracture occurs, patients are troubled by delayed treatment, be it conservative or surgical. Therefore, surgeons should ensure that the fracture has completely healed before undertaking quadricepsplasty. If incomplete healing of the fracture is observed, adequate bone grafting should be conducted to prevent refracture. Two clinical features can mislead surgeons into believing that a fracture has healed completely. One feature is that even patients with incomplete healing may be able to maintain a single-limb stance with the knee locked in an extended position during preoperative examination. Another is that, in our view, the interpretation of the plain radiographs of these patients may be confusing. 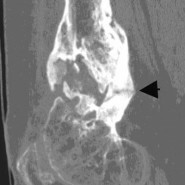 If suspicion is raised regarding the completion of osseous healing, computed tomography may accurately illustrate the continuity of the cortical bone or lack thereof. The mechanism of refracture appears to derive from 2 factors: (1) quadricepsplasty compromising the contracted soft tissue that may reinforce the incomplete osseous structure in the supracondylar region, and (2) improved flexion of the knee provoking a bending movement in the supracondylar area. 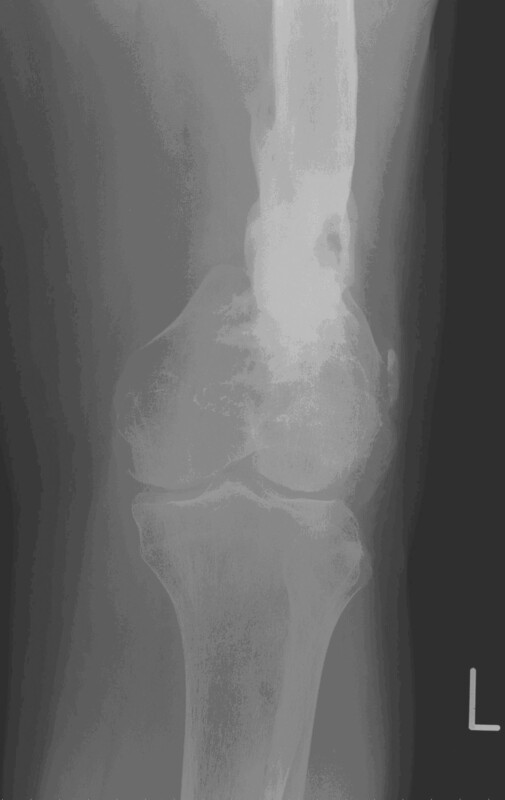 Therefore, quadricepsplasty patients are at increased risk of refracture. Preventing skin complications, especially around pin sites, is also critical. When extreme tightness of the skin is noted on preoperative examination, a tension-releasing procedure such as a skin graft should be considered. We recommend that a plastic surgeon be prepared to join the quadricepsplasty to provide skin grafting if needed. Postoperative rehabilitation should be controlled to avoid over-tightening the skin, as flexion of the knee generates tension on the scar, in turn causing skin ischemia . We expect these management strategies to decrease complications. Bellemans et al  advocated that quadricepsplasty be reserved only for patients with severe extension contracture. However, considering the positive results of quadricepsplasty, we suggest that surgeons should not hesitate to conduct this procedure if decreasing postoperative complications can be ensured [1,8]. Before or during quadricepsplasty for extension contractures of the knee, refracture or pin-related skin problems should also be addressed in patients with distal femoral fractures treated with a lengthy application of external fixation. These patients sustain substantiall damage to the bone and soft tissue and may have incomplete bone healing leading to refracture. Bone grafting and skin grafting would reduce these complications. 1. Hahn SB, Lee WS, Han DY. A modified Thompson quadricepsplasty for the stiff knee. J Bone Joint Surg Br. 2000 ;82(7):992-5. 2. Ebraheim NA, DeTroye RJ, Saddemi SR. Results of Judet quadricepsplasty. J Orthop Trauma. 1993;7(4):327-30. 3. Hussein R, Miles J, Garlick N, Dowd GS. A conservative approach to quadricepsplasty: description of a modified surgical technique and a report of three cases. J Knee Surg. 2008 ;21(1):39-42. 4. Khakharia S, Fragomen AT, Rozbruch SR. Limited quadricepsplasty for contracture during femoral lengthening.Clin Orthop. 2009 ;467(11):2911-7. 5. Ebrahimzadeh MH, Birjandi-Nejad A, Ghorbani S, Khorasani MR. A modified Thompson quadricepsplasty for extension contracture resulting from femoral and periarticular knee fractures. J Trauma. 2010;68(6):1471-5. 6. Alici T, Buluç L, Tosun B, Sarlak AY. Modified Judet’s quadricepsplasty for loss of knee flexion. Knee. 2006;13 (4):280-3. 7. Hutson JJ Jr, Zych GA. Treatment of comminuted intraarticular distal femur fractures with limited internal and external tensioned wire fixation. J Orthop Trauma. 2000;14(6):405-13. 8. Massè A, Biasibetti A, Demangos J, Dutto E, Pazzano S, Gallinaro P. The judet quadricepsplasty: Long-term outcome of 21 cases. J Trauma. 2006;61(2):358-62. 9. García-Cimbrelo E, Olsen B, Ruiz-Yagüe M, Fernandez-Baíllo N, Munuera-Martínez L. Ilizarov technique. Results and difficulties. Clin Orthop. 1992; 283: 116-23. 10. Brosset T, Pasquier G, Migaud H, Gougeon F. Opening wedge high tibial osteotomy performed without filling the defect but with locking plate fixation (TomoFix™) and early weight-bearing: prospective evaluation of bone union, precision and maintenance of correction in 51 cases. Orthop Traumatol Surg Res. 2011 ;97(7):705-11. 11. Thompson TC. Quadricepsplasty to improve knee function J. Bone Joint Surg. Am. 1944; 26 (2): 366 – 379. 12. Herzenberg JE, Scheufele LL, Paley D, Bechtel R, Tepper S. Knee range of motion in isolated femoral lengthening. Clin Orthop. 1994; 301: 49-54. 13. Bellemans J, Steenwerckx A, Brabants K, Victor J, Lammens J, Fabry G. The Judet quadricepsplasty: a retrospective analysis of 16 cases. Acta Orthop Belg. 1996 ;62(2):79-82.